Concrete’s timelessness and versatility separate it from the competition. Besides concrete being one of the most versatile and durable products, concrete provides unlimited color options and infinite design capabilities. Concrete is not a static material, it evolves and acquires character over time, just as humans do. One of the first documented concrete countertops was done in the early 1980’s. 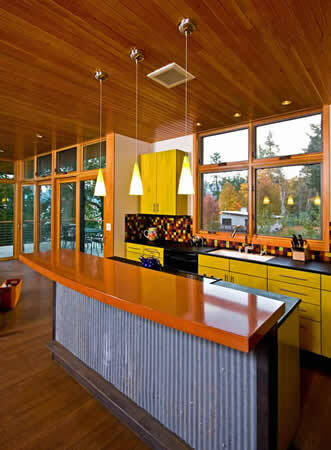 This same countertop has been featured in kitchen and bath design magazines as recently as 2005. Can you think of another product that could possibly receive that kind of publicity 30 years after its completion? Our goal at Stamping Ground Studios (SGS) is to provide you with functional pieces of art in a society that has become increasingly standardized. We do not believe that one size fits all. Each of our clients is unique, and we want to provide you with a product that fits your personal needs. We offer our concrete products to all of Montana and most of the northwest. Please contact us at stampinggroundstudios@gmail.com for an estimate.